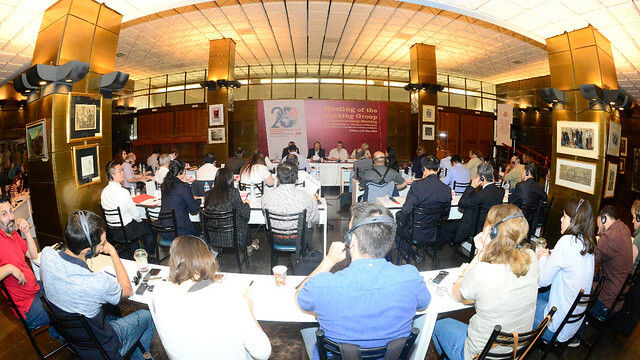 On Sunday, May 20th, 2018, the Headquarters of the Central Committee of the KKE hosted the session of the Working Group of the International Meetings of Communist and Worker’s Parties, that debated issues related with the celebration of the 20th International Meeting that will take place in the current year. In the session of the Working Group the following Parties took part: Communist Party of Brazil, Communist Party of China, Communist Party of Cuba, AKEL (Cyprus), Communist Party of Bohemia and Moravia (Czech Republic), Communist Party of Greece, Worker’s Party of Hungary, Communist Party of India, Communist Party of India (Marxist), Tudeh Party (Iran), Socialist Movement of Kazakhstan, Worker’s Party of Korea (DPRK), Lebanese Communist Party, Communist Party of Mexico, Communist Party of Pakistan, Palestinian Communist Party, Portuguese Communist Party, Communist Party of Russian Federation, Russian Communist Worker’s Party, Syrian Communist Party, South African Communist Party, Communist Party of Spain, Communist Party of the Peoples of Spain, Communist Party of Turkey, Communist Party of Venezuela, Communist Party of Vietnam, Communist Party of Ukraine. The Working Group decided that the 20th International Meeting, that will be hosted by the KKE in Athens, taking into account the completion of 100 years of life and activity of the Party, will take place on November 23, 24, and 25, 2018, themed: “The contemporary working class and its alliance. The tasks of its political vanguard – the Communist and Worker’s Parties – in the struggle against exploitation and imperialist wars, for the rights of the workers and of the peoples, for peace, for socialism”. During the session of the Working Group the Parties exchanged opinions on the international and regional developments. Many Parties made reference to the disturbing developments in the area of the Eastern Mediterranean and of the Middle East, condemning imperialist war and interventions, particularly the bombing of Syria by the USA, Britain and France, as well as the murderous attack of Israel against the people of Palestine, primed by the decision of the USA to move their embassy to Jerusalem. Moreover, many Parties that took the floor denounced the decision of the USA to withdraw from the deal on the nuclear program of Iran. Many Parties noted the significance of the mass anti-imperialist demonstrations that took place in many countries, in combination with the struggle for workers’ and peoples’ rights, as it was particularly highlighted by the recent massive worker mobilizations for May 1st in many countries. Simultaneously, the necessity to further reinforce the internationalist solidarity with the Communist Parties and the communists that are under persecution, or that their political activity is hindered, was highlighted in the debate, so that a decisive response is given to anticommunism, which is showcasing the limits of bourgeois democracy. The Parties had a fruitful exchange of views regarding the promotion of the Common Activities that were decided in the 19th International Meeting of Communist and Worker’s Parties in Leningrad last year. We should note that the representatives of the Communist and Worker’s Parties were invited and watched with great interest the activity of the Organization of Industrial Workers of the Attica Organization of the KKE, themed “Industrial proletariat: the vanguard in the struggle of the working class for the abolition of capitalist exploitation, for socialism-communism”, with D. Koutsoumpas, GS of the CC of the KKE as the main speaker.